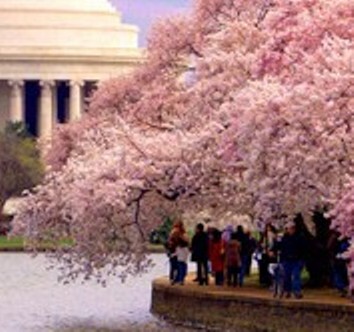 WASHINGTON, DC - (@The Comedy News) - Officials in Tokyo, Japan admitted today that the gift of Cherry Blossoms to the city of Washington, DC in 1912 was only a scheme to agitate Americans' allergies. "Yes, the gift of 2000 Cherry Blossoms to Washington, DC one-hundred years ago today was only a deceptive trick to make Americans sick and miserable," a Tokyo city official announced. "We are not saying we are sorry, we're just taking credit for this hilarious Trojan horse you all can't seem to get enough of." The tree pollen emitted by the Cherry Blossom trees has wreaked havoc on DC inhabitants and the millions of visitors who flock in droves each spring to see the pink cherry blossom trees in bloom. For decades, some people have suspected that Japan's "generous gift" of cherry blossoms to the United States in the Spring of 1912 was indeed a deceptive means to make Americans miserable and sick. Now that those rumors have been confirmed, historians are suspecting that President Harry S. Truman authorized the atomic bomb-dropping on Hiroshima and Nagasaki as payback for Japan's snotty prank.